Cigniti’s Salesforce testing services help enterprises validate their customized Salesforce functionalities and integrations with other enterprise apps. 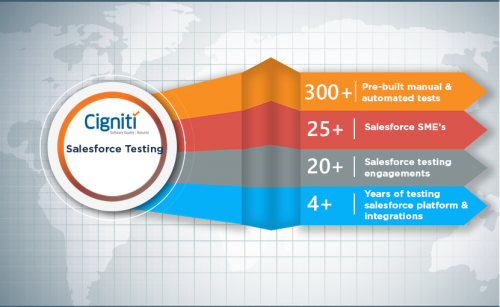 Cigniti provides a wide range of testing services covering all modules of Salesforce such as Accounts, Leads, Campaigns, Contacts, Opportunity and Reports. Cigniti provides full life cycle testing services to help organizations implementing Salesforce.com or Independent Software Vendors (ISV) building Force.com applications. 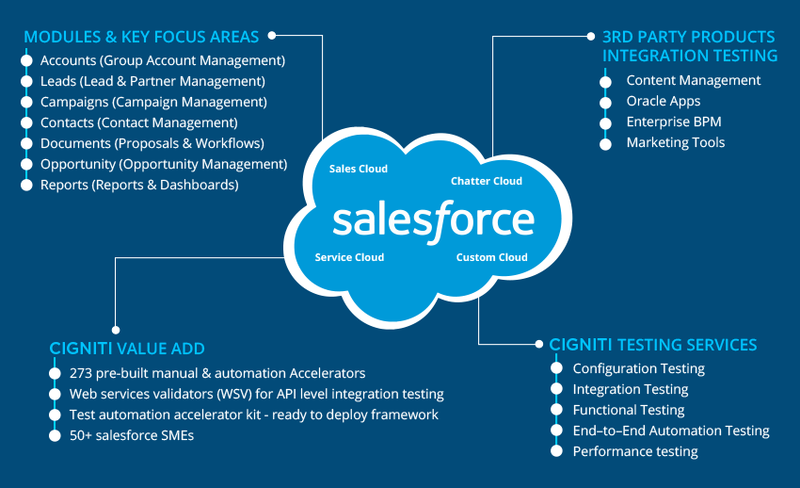 Cigniti’s Salesforce testing service spans across the various components of Force.com platform such as Configuration, Integration, Customization, App Exchange components, and Cloud. As part of our efforts in designing the best automated functional testing solution for Salesforce, we have experienced experts in testing applications for the Force.com platform. Follow Salesforce best practices for testing at various levels (Unit testing, Functional testing, and Integration testing), improving overall coverage. Build automated suite of regression test to ensure that applications are developed rapidly and with high quality. “Cigniti’s Salesforce Testing CoE team comprises of 25+ subject matter experts (SMEs) specialized in testing Salesforce and Force.com applications. Our testing experts possess strong functional, domain and technical knowledge and provide the competencies to cover all facets of Salesforce testing. Cigniti’s Salesforce Testing CoE team has built a repository of pre-built test accelerators including both manual test cases and automated test scripts, well-defined test data management processes, and robust test automation framework for Salesforce. Cigniti’s pre-built test accelerator suite comprises 300+ manual test cases and automated test scripts that are customized based on client requirements. Cigniti’s Salesforce testing experts can help you build and maintain a proven test strategy to ensure lasting success for your Salesforce implementation. Some of the Key Testing Services we offer are Functional, Unit, Regression, Governor Limit, Integration, Deployment, and Security. We also assist clients in performing User Acceptance Testing (UAT), Sandbox testing, UAT Support and Production Testing. Cigniti’s proven IP-led Test Automation Framework for Salesforce encompasses 90+ function libraries to jumpstart testing during Salesforce implementation. 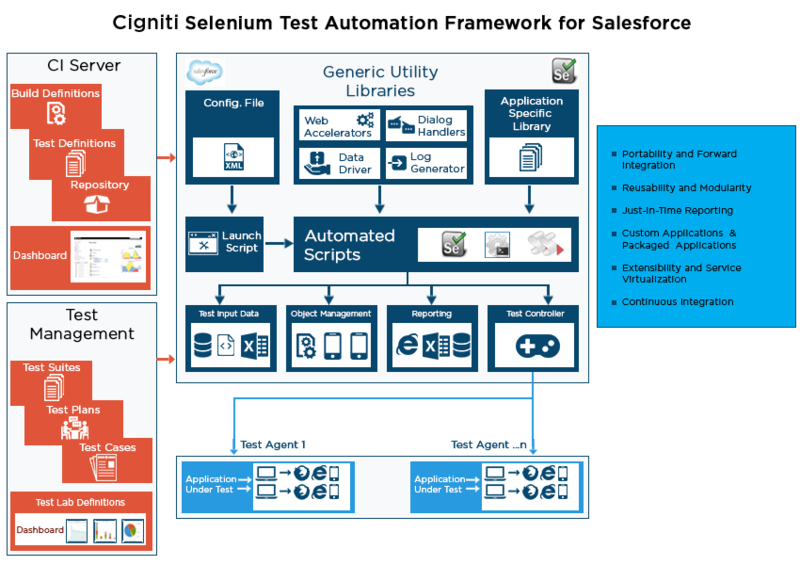 Every enterprise workflow is different; Cigniti’s Hybrid Test Automation Framework is built to deliver the agility that the clients require for their critical Salesforce CRM. We provide Salesforce testing services including Functional Testing, Manual Testing, Automated Testing, Load & Security Testing services. Our unique testing services delivery model integrates usage of our IP-led Salesforce Test Accelerator with the expertise of our Salesforce testing professionals. Leverage the advantages of working with Salesforce Certified Administrators who are well-versed with agile and DevOps methodologies to bring agility to your testing lifecycle. Salesforce is targeting to double revenues to $20B+ over the next four years and sustain 20% growth.